We started tackling our guest bathroom this weekend. We decided to start with this bath so that we had something nice for guests (and us) to use since the master bath will be a total gut project that we'll hopefully start in late summer/early fall. From far away this bathroom may not look terrible, but the tile was cracking, there was mold all along the grout lines and behind the tile, and it was also incredibly dirty and gross. We're changing out the vanity, adding an additional sink, updating lighting, tiling, hardware, and venting, adding a new, deeper tub, and removing (hopefully) the bulkhead above the shower, toilet, and vanity. We haven't opened it up yet, but I'm hoping there isn't anything in there and it should be an easy removal. Dirty, dirty tub, cracked tiles, and cheapo toilet. This is all going! Don't even get me started on this texture. I hate, hate it. The previous owner also textured the ceilings with a completely different sponge texture, so it's a total mess. I purchased a drywall sander and (hopefully) will be sanding down these walls. I really hope it goes well, because I would love to sand down the rest of the house, too. Chipping these tiles off the wall was surprisingly satisfying. I did most of the shower while Charlie tackled the vanity demo. I'm going back and forth on whether or not I want to keep this privacy wall. I'm leaning towards yes, only because the toilet and tub area of this bathroom are about an inch and a half higher than the vanity portion (you can see the previous owners remedied this by stacking two transition strips on top of each other, ha! ), and I'm not ready to commit to having someone come in and fix that so I'll probably just work with it. Here is a photo of the tiles we will be using. I love how classic and clean this combination is. 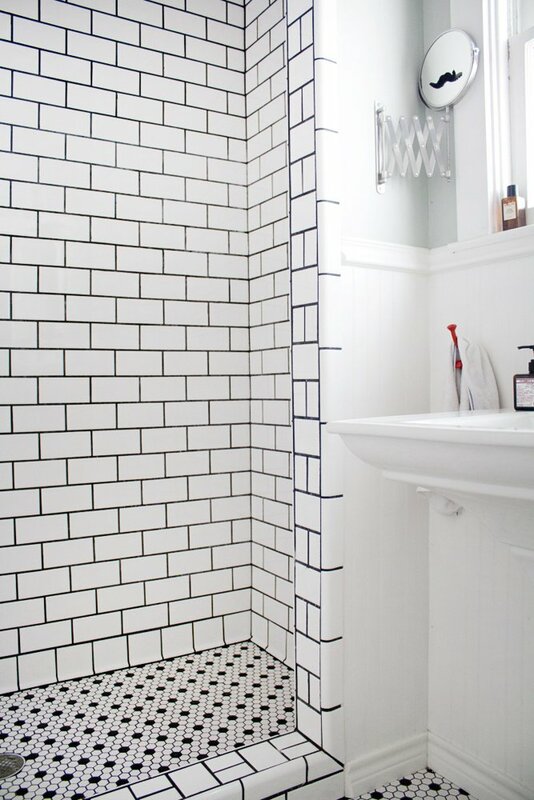 We're going with gray grout so the contrast won't be as severe as it is in this photo, but it will still highlight the shape of the tiles, which a I really want. You can see the rest of the fixtures that we picked out on my home board! Our goal is to have the bathroom completed in three weeks, but I'm optimistic that we'll be finished in two. We're also making major progress on our backyard. We're trying to get someone to come out and lay sod this week, and all we'll have left are flowers and furniture. After all of our hard work I can hardly wait to see it come together!